TRANSCRIPT:Here are a few thoughts on E and O insurance. I'm John Harrington. E and O insurance, or errors and omissions insurance is a really valuable insurance offering that extends the benefits of your general liability insurance to cover claims by a client of neglect or inadequate services. It will pay for your attorney costs any settlement costs it's really a nominal amount of money in addition to your general liability insurance and is well worth it. Look in to various E and O riders that might be available from your insurance provider to have that extra amount of coverage. I would strongly encourage you to consider errors and omissions insurance because, if someone suggests to you, ""Well, Oh, you didn't do a good job"" or didn't do a good enough job, you didn't turn up, any variety of things that could go wrong errors and omissions insurance will cover you. It's worth looking into. TRANSCRIPT:Here are a few thoughts and moving up to the next caliber of client. I'm John Harrington. Clients come in all shapes and sizes. They could be mom and pop corner store down the street, it could be the local grocery store, could be the local store that sells clothing and apparel, it could be a national chain, it can be an international chain. All of them are in kind of a hierarchical scale, not just the in the level and quality of work that you're doing for them, but also in the economic sphere. Whether the mom and pop store might consider $200, $300, $400 to be the most they should pay for photography, whereas an international apparel company recognizes the hundreds of thousands of dollars necessary to pull off a shoot that showcases their entire line. It's really important for you to understand the escalation from one tier to another and understand that your rates are going to raise as you're going up. So think about that. Think about raising your rates to increase yourself from one tier of client to the next. TIPS60 - Why register copyright? TRANSCRIPT:Here are a few thoughts on the value of registering your copyright. I'm John Harrington. You can shoot all you want, make as many pictures as you want to and have your work stolen and deal with your clients without registering copyright if you want to, but ultimately registering your copyright with the United States Copyright Office is incredibly important because it allows for you to actually file a claim in federal court for copyright infringement. It also allows you to have statutory damages, which is basically a penalty or punishment for infringement of copyright and here's the big deal, it actually allows for you to have your lawyer's fees paid for by the people who stole your photography. It's very important you register copyright methodically and on a regular basis. It's something you can do every month, every two months and have a full force and effect of copyright registration as if you had done it the day that you took the picture. You have a 90 day window to register and still have full protection. So register your copyright all the time. The Carlyle Group owned Getty Images may be operating in a deceptive manner as it relates to the reporting of income, sales, and licensing of content under their recently announced deal with Pinterest. Under the now private ownership of The Carlysle Group, very little about the business dealings of Getty Images is available, but from time to time, interesting news can slip out. "Getty Images and Pinterest have struck a multi-year deal to drive a more visual world by combining our rich metadata and compelling content ..."
"Let’s say you’re browsing Pinterest and see an image of Beyonce wearing totally fierce boots. But there’s no information about who designed them or where you can get them! It may also be hard to find out that a fantastic Getty Images photographer shot the picture." Now, Getty makes it clear that the metadata is what's being sold/licensed, and that the photo then gets "photo credit" and a link. "Our new partnership with Pinterest offers a solution....we’ll use our API, Connect, to provide relevant metadata to Pinterest – including Getty Images photo credits, where and when the image was shot and more. We’ll get a photo credit for our images on Pinterest’s site and a link back." If a photo licenses for $1.00, what do you suppose the metadata would license for? $0.01? $0.10? Certainly, the figure is a fraction of what the image would license for, and then, that fraction of the photo licensing income is shared at Getty's disproportionate percentage split in their favor. Nowhere does Getty state that Pinterest is paying for an image license. Why is it important then, that Getty make it crystal clear that the payment is for Metadata? Let's look closely at a few sections of Getty's contract with contributors. "This Agreement applies to all Content (as the term is defined in Section 1.2) that you have previously submitted and, in the future, will submit, that is accepted for distribution by Getty Images (“Accepted Content”). " "1.2 Types of Content: This Agreement will apply to the following types of content (the “Content”): (a) photographs, illustrations, or other still visual representations (“Still Image(s)”); (b) moving visual content in any form including, film, video tape, digital files, animation and clips (“Footage”); and (c) font, audio file and any other work protected by copyright, in all cases, generated by any means and in any format or medium, including any reproductions and any modifications and derivative works thereof. " It's clear there, above, that the content is "photographs" - not metadata. Below, Getty first states what should be obvious - that you own the rights to your "Accepted Content", however, Getty then goes on to make it perfectly clear that "Getty Images will own all right, title and interest, including all copyrights that arise apart from the copyright in your Accepted Content, to all types of derivative works created by or for Getty Images that contain multiple items of Accepted Content and/or other Content:"
1.13 Copyright to Accepted Content and other Works. Subject to the rights granted in this Agreement, you will retain all right, title and interest, including copyright, in all Accepted Content including when it is incorporated in a derivative work created by others. Getty Images will own all right, title and interest, including all copyrights that arise apart from the copyright in your Accepted Content, to all types of derivative works created by or for Getty Images that contain multiple items of Accepted Content and/or other Content. Either you or Getty Images on behalf of you may register the copyright in any Accepted Content with the relevant copyright authority. So, apart from the "photograph" part of "Accepted Content", Getty owns everything else - metadata, "and/or other Content". Again, contributors are being compensated for a fraction of a metadata fee rather than a fraction of a photo licensing fee, because Getty has made it perfectly clear that they're only being paid for metadata. At a conference held here in the Washington DC area, the US Patent and Trademark Office held a conference - "Copyright Policy, Creativity, and Innovation in the Digital Economy" (details here) for a day-long conference. I watched the webcast, and participating in the conference was John Lapham, Senior Vice President and General Counsel for Getty Images. Here's the video: If you scrub forward to about 19:10 in the video, the discourse on this subject begins. "....a healthy percentage of their content belonged to Getty Images contributors, and rather having a slap flight about what should and should not happen with pictures on their site, to say, as pictures are moved around, you lose the metadata, you lose the attribution. and instead of yelling at each other about whether or not you should be licensing pictures or not, let's reattach the metadata properly to those images, and let's have our contributors in turn receive the royalties that they are due for the use of their content. That was the goal in reaching that type of arrangement..."
"Thank you. umm, so can I, just to clarify my understanding, it was, metadata - you re-attach the metadata, was their also a kind of a payment, or was that for, they would be tagged for future uses they would have the metadata?" "Uhh, the arrangement works so that, uh, as, we have a database, an imagery database, that contains, you know, tens of millions of pictures, not only of ours, but of competitors, of other companies, and we can match that database of images up against a website to find out what the matches are. And so using that image recognition technology, we can say, you know, we can say, looking at the USPTO website for instance, that you have 110,000 Getty Images photos on there, and those images no longer have their metadata, we'll re-attach that metadata and the fees that can be charged for that can be on a per image per month basis so that the individual who created that work is in turn being compensated back for that." "let's have our contributors in turn receive the royalties that they are due for the use of their content." "we'll re-attach that metadata and the fees that can be charged for that can be on a per image per month basis so that the individual who created that work is in turn being compensated back for that." So, the fee being charged is for re-attaching the metadata? When he says "the fees that can be charged for that", he's clearly referring to the action earlier in the sentence "we'll re-attach that metadata..." and then, does the "compensated back for that" at the end of the sentence - does the "that" refer to their being the one who "created that work" or the re-attaching? 1.11 Right to Control Claims. Getty Images shall have the right to determine, using its best commercial judgment, whether and to what extent to proceed against any third party for any unauthorized use of Accepted Content. You authorize Getty Images and Distributors at their expense the exclusive right to make, control, settle and defend any claims related to infringement of copyright in the Accepted Content and any associated intellectual property rights (“Claims”). We're asking a nuanced - but very serious question here. Lapham makes it clear that a healthy percentage of images on Pinterest are Getty's contributor images. Up until the deal, the presence of those images were infringing on the copyright of the owners of the images. Getty stated they didn't want to get into a "slap fight" with Pinterest. We're talking about millions of images, and the difference between what a photographer would receive as a portion of metadata fee versus a portion of income from an image license could mean millions more dollars in Getty's coffers at the expense of the contributors, just because of how the agreements between Pinterest and Getty, and between Getty and it's contributors, are written. It would seem to me that it's deceptive to announce a deal where income comes from metadata, but then to -- in a not-as-widely-distributed forum where the message isn't massaged by countless re-writes of a press release -- to get a different answer that Getty may well actually be getting paid image licenses, for which they would, in turn, owe contributors the higher figure. Clearly the moderator had a different understanding going into the question, and she's a well regarded attorney advising the government on intellectual property matters, so it's not an insignificant detail that she's confused by what Lapham said as incongruous with the previously announced deal. So, the question on the table that Getty Images contributors are due an answer to is "Are we being compensated for our Accepted Content (i.e. photographs) or are we being compensated for the metadata?" Lapham made it clear that they are due their royalties for the use of their content. The follow up question is - "How much is the gross income per photo licensed, and how much is the gross income for the metadata fee for re-attachment and display?" TRANSCRIPT:Here are a few thoughts on how to maximize the tax deductibility of a meal. I'm John Harrington. If you have a staff, if you have people working for you, when you're taking them out to a meal and you go to a restaurant and the bill is $100, you're actually only able to deduct about half of that. That being said, if you order carry out or take-out from that restaurant, bring that meal back to your office, the same exact meal, it becomes then an office meal, a meal taken in your office and as such is 100% deductible so that $100 charge you can deduct at $100 rather than $50. Now, I'm not an accountant, you just check with your accountant on this, but the benefit of having that meal in the office at 100% can be well worth getting in the car and bringing it back to the office and sitting around a table in the conference room, or otherwise just talking business in the office environment. So look into the tax deductibility of your meals and how to deduct them by maybe bringing them back to the office. TRANSCRIPT:Here are a few thoughts on what you might want to be doing when you're thinking about the potential for transitioning from staff to freelance, either expectedly or unexpectedly, related to business cards. I'm John Harrington. Now you should always have your own set of business cards with your own cell phone number and your own contact information and you should be handing those things out when you're talking to PR people or editorial clients that you might be working with from time to time on the side, if you're allowed to work on the side with clients. Having your own personal business card, handing that business card out on a regular basis is a good thing because it gets your name out there. Obviously, you need to be sensitive to any restrictions that your company has about doing freelance work or handing out your personal business card, but you should always have one when the opportunity presents itself. Be giving that business card out, generating a collection of clients that are interested in you and your professional services as a photographer. And if you can't do the job, what you can do is take that phone call and refer it on to a friend or colleague who you think might deserve the work. TRANSCRIPT:Here are a few thoughts on disability insurance. I'm John Harrington. Disability insurance both short-term disability and long-term disability is something that you should have as a part of your kind of business package of insurance as a photographer. Frankly, for any business where you have the option you should take disability insurance. Should you become disabled for three weeks, a month, six months, or a year, having disability insurance allows for you to have an ongoing stream of income from that insurance policy while you're recuperating, while you're recovering, so that you can get back to work. So that you don't have to actually sell-off assets in order to pay your bills and just generally lets you stay within the house that you have you know, other accommodations, things to provide for your family. Having disability insurance, comparable to long term care insurance, but just kind of a different flavor is something you should look into. Talk to your accountant about the tax deductability of it, but it's not that much and generally speaking it's less than $100 a month. TRANSCRIPT:Here are a few thoughts about maintaining your independence. I'm John Harrington. Now when I say maintaining in your independence I'm not talking about having working an employee or working for one particular corporation I'm really talking about not getting into discussions with your clients that could end up causing you to not work for them again because they don't like your political leanings. Now we're based here in Washington, DC and you know there's democrats, republicans and then there's a few independents. I strongly encourage you, at least when you're dealing with political issues, to not be discussing the hot-button topic items of the day at least not in a situation where you're taking a position because it really could be contrary to your clients. We work with democrat clients, republican clients, and yes occasionally independents, but really stay away from having those conversations with clients unless you really know them well and you have a relationship with them outside of your work environment. It just really doesn't bode well for you to have those types of conversations for long-term success in this field. TRANSCRIPT:Here are a few thoughts on family portraits and sitting fees. I'm John Harrington. We love doing portraits, with a couple, with the whole family, where we get to sit down and talk to them about how they would like to have this timeless moment with either, just a couple or an entire family memorialized, because it really is going to become a family heirloom. So when we do that and the time that we invest in sitting down with them and talking to them the time that we spend actually taking the picture, we do charge a sitting fee for and it's important. Sitting fees can be as little as you know $200 to as much as $500 when you're working with a couple. It locks in your time. It does compensate you for your time working with them beforehand and also when you there on the day of the shoot, taking those pictures. If, after the fact, the couple or the family doesn't like any of the pictures they still have to pay for the sitting fee, but if they do like their pictures then that's when they have to end up paying for the enlargement. TIPS60 - How to upsell prints for Family Portraits. TRANSCRIPT:Here are a few thoughts on helping your client select the right size family portrait after you've done the photography. I'm John Harrington. Now, when you sit down with a client and talk to them about what size do want, you really shouldn't be talking in sizes, 8x10, 11x14, 16x20 because in most people's mind 8x10 is as large as they need. So I would encourage you to use sizes like desk size, small wall size, medium wall size, large wall size. That really helps the client understand where the picture's going to go, helps you understand what they're looking for and gets everybody away from this 8x10 figure that nobody seems to want to go above. Sometimes you can bring a portrait that you've done for somebody else into a home and show it up on a wall for the client to see how that size would look in their home and help them decide based upon size commensurate with the wall and not just based upon the numbers. TRANSCRIPT:Here are a few thoughts on administrative fees. I'm John Harrington. We deal with a lot of clients who may not be paying in thirty days or even sixty days or gosh, even ninety days. The problem is that all of our vendors require thirty day turnaround. As such, we've implemented and have been using successfully for about twenty years an administrative fee where we pre-bill the client a 10% surcharge and allow them to take it as a discount if they pay on time. This is also a great opportunity, when a client says, ""Hey,I'm a non-profit, what can you do?"" You can say, ""Well we'll give you a 10% discount if you pay on time."" We always pre-bill these administrative fees, however, because unlike the electric company, we can generally not be adding on an administrative fee after the fact to the next bill, because that really doesn't work that way in the client relationship that we have. So administrative fees are a great solution for helping you keep your bills paid on time. 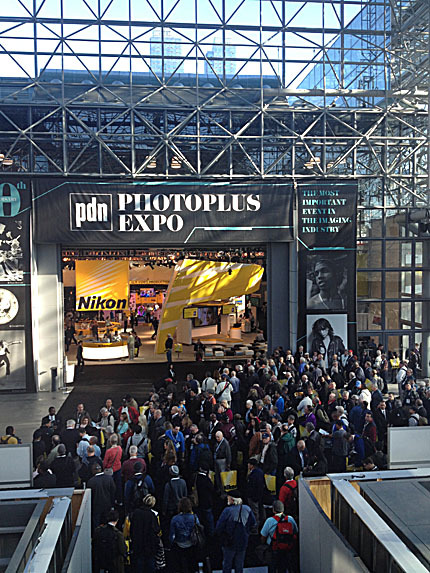 This year marks the 30th Anniversary of the PhotoPlus Expo, which takes place in the Jacob Javits Convention Center in New York City. There slogan this year is "Honoring the Past, Envisioning the Future", and it's quite appropriate for an event as storied as this. Each year tens of thousands of professional photographers, those that aspire to be professional, and yes, on Saturday, the weekend-warriors make it out to see the latest and greatest in what is out there for photographers to better be in business. There are some that suggest that everything they need to know or learn about when it comes to technology, class-style learning, and so on, can be garnered from online resources. Yet, as connected as we are, the PhotoPlus Expo really delivers an excellent signal-to-noise ratio that cuts through all the posturing and gives you a hands-on experience like you can't get many other places. There are many vendors that I find that I never would have, save for the opportunity to walk the aisles and discover interesting things. Here's one. 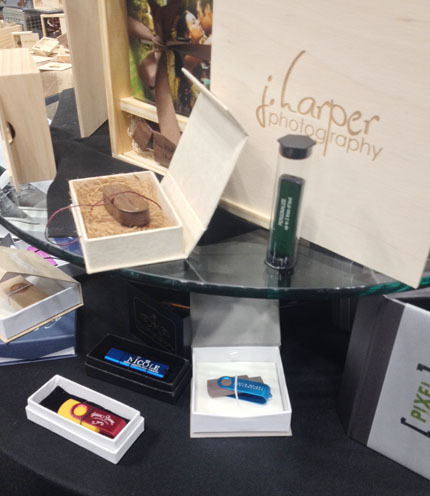 PhotoFlashDrive.com is a really cool vendor that lets you deliver customized USB drives with your logo, along with customized packaging. One that piqued my interest was the crystal drive that really is slick. Here's one of their displays. The seminars are another great place to get that hands-on connection that YouTube and Vimeo just can't give you. Make your way down to Javits if you're here in town. If not, it's an inexpensive bus-ride or quick train trip into town. TRANSCRIPT:Here are a few thoughts on how to best set up your Quickbooks software for use as a photographer. I'm John Harrington. Setting up your Quickbooks properly is critical to understanding your business how it's running, where the money is going, where it's coming from, and how to best manage it. I can't stress enough the importance of doing this. Setting it up properly makes sure that your expense categories and the chart of accounts are correct. PPofA Professional Photographers of America has a really great resource, if you simply Google PPofA Quickbooks categories or follow the link below, you'll get there, there's a whole host of information on how to set up your Quickbooks. It's a really great resource and checking it out, making sure that your system is set up to a standard to make sure that all your finances are right really will set you apart, make your accountant happy, and really let you understand how your business is running. TIPS60 - What Exactly is a Purchase Order? TRANSCRIPT:If you're a photographer, or any business for that matter that is doing business with other businesses, a purchase order is something that you're probably, if you haven't already seen it, will likely see very soon. If you're doing direct business to consumer, if you're dealing with the general public as your clientele, if you're a wedding photographer, if you are doing family portraits of some sort or even senior portraits, you're not gonna see purchase orders. Purchase orders are when you're doing business with corporation "X" or corporation "Y" and it is essentially an approval to pay you once work has been performed. It's a document. A purchase order you'll be often given a purchase order number. Sometimes you're asked to sign a purchase order. The problem with purchase orders, if you're not careful, is that there can be contract language on that purchase order that transfers ownership of your creative endeavors, your photography, to the company as a part of their boilerplate purchase order. So you need to make certain that your purchase order language has been reviewed, make sure that none of those things are on there that are egregious, changing the rights that you have on your existing contract. TRANSCRIPT:Here are a few thoughts on tablet computers in your photography business workflow. I'm John Harrington. iPads and tablets are great because they allow the client to see the images you're shooting when you're shooting, whether you're transferring images wirelessly from your camera straight over to the tablet or whether you're shooting tethered from the camera in the tablet, especially when you don't have a full-blown digital workstation setup for the client to see. Sometimes when you're working on the fly or working in a tight environment, you don't actually have the ability to set up a complete digital workstation so a tablet is great. In addition, especially if you're shooting wirelessly as you're shooting, as you're working, it gives the client the opportunity to review the images you're shooting, make certain that you're delivering exactly what they need, what they want, and give you requests or say, ""Hey, I this is a great, but I need you to shoot this as well."" Having a tablet, having an iPad for client review is really a great tool to make certain that the clients happy with everything you're delivering. TRANSCRIPT:Here are a few thoughts on how to be an invaluable assistant. I'm John Harrington. When you're assisting a photographer, your role is to make the photographer's job easier, to make it possible for the photographer to focus on making the pictures. That means you need to do what you're told, when you're told and exactly how you're told, and don't complain about it. If you're asked to do something, if you don't do it, the photographers going to end up having to do it or another assistant going to end up having to do it. So the thing you need to do is focus on making photographer's life easier. Carrying equipment, thinking two, three, four steps ahead of photographer, anticipating what might be happening. Make yourself invaluable, the photographer will call you again and again. But it's important for you to understand that you're not there to socialize with the client, you're not there to socialize with the photographer, you're there to get a job done and help the photographer get the job done right and make that photographer look good. Any questions, any dialogue between the client and you, you need to defer to the photographer. TIPS60 - The science of choice - how many packages do you offer? TRANSCRIPT:Here are a few thoughts on the science of packaging your photography. I'm John Harrington. Whether you are doing weddings or family portraits packaging up the services you provide, the number of reprints, an album, a large wall portrait, is something that you definitely want to consider offering, but the question is, how many. Well if you offer four packages, for example, most clients are not going to choose what is, Charles J. Lewis, who is a old well-regarded lecturer, speaks about called the ""whopper package"" or the biggest package. Most people are not going to choose that package, so you always wants to design a package at the top end of the scale that is something that is highly unlikely that any client will ever choose. Then you want to look, and most clients are also not going to choose the cheapest package. You put that down there as kind of the bare-bones package. So you often have one or two, probably two packages right in the middle that offer two different types of services or quantities of products in there. Understand that that is your sweet spot, those are the two packages your clients are going to choose from. TRANSCRIPT:Here are a few thoughts on transitioning from staff to freelance and your cell phone number. I'm John Harrington. When you find yourself unexpectedly transitioning from staff to freelance one of the things that people are going to try to reach out to you and talk to you whether they are perspective future employers, friends, colleagues, or even family members, is to reach out to you and call you on your cell phone. Now the problem is if your cell phone belongs to the company, is owned by the company, and the company also owns the number, the likelihood that you can actually walk away with that cell phone number is not very high. Now it's even less if you left the company unexpectedly because somehow you're fired for whatever reason. So the key thing to do is to have that cell phone be a cell phone that you pay for, your company reimburses you for. The company may give you an option to reimburse you for your cell phone or pay for it yourself. Make certain that the company reimburses you for it and not that the bill automatically goes to the cell phone company, excuse me, automatically goes to the company itself. By doing so, that lets you keep your cell phone number when you transition from staff to freelance. TIPS60 - What is a Non-Compete Agreement? TRANSCRIPT:Here are a few thoughts on Non-Compete Agreements. I'm John Harrington. A Non-Compete Agreement is essentially an agreement that someone enters into with you or you enter into with someone else that says if you and I are doing business and I'm hiring you often as a photographer, for example, that you won't then compete with me for my same clients. Non-Compete Agreements are important because it preserves your ability to maintain your clientele without fear that when you hire a subcontractor that that photographer isn't going to then in turn poach your clients. The challenge, of course, is that non compete agreements, oftentimes, are un-enforceable for a variety of reasons. It's not like you're selling a widget. It's not like you're procuring a particular technological person who is capable across a spectrum of things when you're dealing with photography. Non-Compete Agreements are important, but at the same time they are often difficult to enforce. TIPS60 - Where do clients psychologically "break" on price points? TRANSCRIPT:Here are a few thoughts on pricing breakpoints. I'm John Harrington. When it comes to photography, frankly any business, when you're talking to clients about price they do have pricing breakpoints $500, $1,000, $2,000, $5,000, $10,000 and it goes on, but let's work with those for right now. Most clients, when you're talking to them, do have a dollar figure in their head when you're talking about the budget, but they have these breakpoints and so that's why pricing is now $9.99 or $999.00 rather than $1,000. There is a psychology behind pricing. So when you're talking to a client you need to understand what their pricing you know where they're going to react, what their breakpoints are. Get a feel from them about what they are trying to spend and understand that if you increment say above $5,000 or $6,000 that the breakpoint probably is closer to $10,000. If your break point is somewhere in the $500 range they might actually go right above $500 they might go to $1,000. TRANSCRIPT:Here are a few thoughts on your portfolio and your own archive. I'm John Harrington. When you're a staff photographer all of your images, generally speaking, are archived on location at your workplace, but what you want to do also is have your portfolio samples, your best examples of your work as a professional photographer, archived in a safe place so that, should you lose your job, you're in the position where you can actually demonstrate to other future potential employers that you're a capable and talented photographer. So it's important for you to have an archive copy of your portfolio images offsite from your workplace because if the company loses their servers or decides to shutdown unexpectedly and you don't have those copies of the work offsite you're in trouble. Now of course, you need to be consistent with your workplace policy. Don't take work away from your office that you not allowed to. Check with your photo editor, check with your supervisor, make sure it's okay for you to have those copies. But you want to do that sooner rather than later so that you're always prepared for the unexpected. TRANSCRIPT:Here are a few thoughts about balancing the fun photography and the photography that pays the bills. I'm John Harrington. When you do going out and taking phone calls for doing photo assignments, some of those assignments are exciting, a lot of fun, a lot of energy, you come back and you're like so blown away because you totally were in love with the the assignment that you did. Then there's the ones that you groan and say, ""Gosh, I wish I didn't have to go do this today"", but the reality is that you have to strike a balance between what you love to do and what pays the bills. There are a number of times I've gone out on a variety of different assignments and I gone, ""Oh, I just would rather not be here"", but the reality is that it is what pays the bills. I would encourage you if you're doing a lot of that bill paying photography go out and spend some personal time doing the photography that you love just to kind of keep your creative juices flowing, to keep yourself happy and upbeat. There is always going to be a balance of doing what you do for love and doing what you do because it has to pay the bills. TIPS60 - When do you just say "no"? TRANSCRIPT:Here are a few thoughts on the power of ""no"". I'm John Harrington. When you say ""no"" when someone makes an offer to you or makes a request off you that's unreasonable, that gives you a great deal of power. Now I'm not talking about power over somebody, but power in controlling what you do what you provide in the services that you are rendering. If someone's offering you or making you an unreasonable offer, you need only say ""no"" to that client. Now if you don't have any other alternatives, if you have to say ""yes"" to that particular job or that particular request because you need the money, your rent is due and you have no money in the bank, then you really don't have the power to say ""no"" then you are at the discretion of that clients request and you may have to fulfill it. But if you have other options, if you can afford to pay the bills because you have the reserve, saying ""no"" is very empowering. In addition when you say ""no"" just say ""no"" nicely, ""Gosh, I can't do it for that rate but I'd be happy to discuss with you a rate that works for me." TIPS60 - How much time do professional photographers actually spend making photographs? TRANSCRIPT:Here are a few thoughts on on how photographers actually spend their time. I'm John Harrington. Most people, when they think about photographers and photography, think, "" Oh, I'm gonna be traveling the globe, slinging the camera on my shoulder, the camera bag, seeing the world, taking pictures"" and that's that. The reality is it's nowhere near the case. Most photographers spend, on average, about twenty percent of their time making pictures. The rest of the time is administrative. If you think about a wedding photographer for example, they may spend six to eight hours on a Saturday making pictures and maybe six to eight hours on a Sunday making pictures, but they're spending Monday through Friday doing post-production, talking a prospective brides and grooms about working, there's such a variety of things that they're doing that isn't making pictures and every job has its boring aspects, but for photographers you really can count on about twenty percent of the time to be making pictures and the rest doing administrative and paperwork. So that's about about how long photographers spend making pictures. TIPS60 - What's an NDA? TRANSCRIPT:What's an NDA? I'm John Harrington. An NDA is a non-disclosure agreement. It's an agreement between you and a client or you and an assistant to not have things disclosed outside of the scope of the work that you are performing. Non-disclosure agreements are very common when you're working with high profile clients and frankly assistants should be signing non-disclosure agreements with you to not talk about the details of a photo shoot they worked with you on. You should be getting non-disclosure agreements from your assistants and also many times your clients can ask you to not disclose what you learned, any company trade secrets or anything about a new product coming out that you might have just photographed. NDAs are very common. Read it. I'm not a lawyer so I'm not giving legal advice, but I strongly encourage you to understand the importance of an NDA and to respect an NDA. If somebody asks you about a shoot you were on and you can't talk about it because of an NDA, just say, "I can't talk about it because I'm under and NDA." TRANSCRIPT:Here are a few thoughts on the idea that hobbyists can actually do some damage to the livelihoods of photographers they admire. I'm John Harrington. If you're a professional photographer the last thing you want to see, if you're at an event covering something is to see four or five photographers that are hobbyists coming in taking pictures, posting them up online, and ruining your livelihood. If you're a hobbyist who looks up to the photo journalist or the sports photographer, doing it for free, doing it just for the heck of it, and then selling those images or giving them away is really damaging the livelihood of those who are professionally doing photography day-to-day, day in and day out and have bills to pay. So I would strongly encourage you to, even if you don't necessarily need the money, as a hobbyist, to charge appropriately for your work so that you not only get that extra money that lets you upgrade to the next piece of equipment, but you're also not damaging the livelihoods of the photographers that you admire in the community. TRANSCRIPT:I can't stress enough the importance of having a color calibrated monitor, color calibrated printers, and just generally being color calibrated. We use, to do all of our color calibrations, the i1 system it's made by Gretag MacBeth. There are a number of other solutions out there, but the importance of making certain that your monitor is calibrated is so that when you're judging lightness and darkness, when you're judging whether or not an image has too much red, too much green, or otherwise is just not right, not visually correct. You want to make certain that you have everything in a color managed, calibrated to a known standard system. So that when you're speaking to a client and the client says to you, " Oh gosh, the photo looks too dark too light" or what have you, you can ask them, "Is your system calibrated?" Generally, it's not in many instances. And you can encourage that, you can say something like, "Oh, are you looking at it next to a light window?" or what have you. Ask them what environment they're reviewing the images in. But having a calibrated system means that you're calibrating to a known standard. TRANSCRIPT:Here are a few thoughts on professional URLs as you transition possibly from staff to freelance. I'm John Harrington. Having a professional URL is one of the many signs and signals that you send to your clients that you are a professional. You don't want to use something that says something like @cox.net or @rcn or @comcast or @gmail or at @aol or @hotmail. Any of those URLs are not professional URLs whether it's in your email address or in the actual website that you have. You want to make certain that you have something like @johnharrington.com or @harringtonproductions.com or some variation that's shows that you are professional, that you're a business and people should be treating you as such. If you use non-professional URLs, free URLS, like gmail or so on and so forth clients, especially clients that have never heard about you before are going to be questioning whether not you're actually a full-time professional doing this and will be taking you seriously. TIPS60 - Double the money? Are your low rates actually hurting your business? TRANSCRIPT:Here are a few thoughts on your rates and whether or not they're too low. I'm John Harrington. Now it may seem counter-intuitive, but the concept of doubling your rates to earn more business actually is a realistic one. It does actually apply, there is actually some credence to that idea. In some instances there are clients who know that the bill or the costs for a particular services is $1,000, $2,000. And when a photographer, even though they think they're doing the right thing, by saying, ""I'll do the job for $300"" they know, ""Gosh, this photographer may well not understand everything that's going into this project."" So they'll actually hire a photographer that's more expensive. So if you're looking at your rates and maybe you want to move up to that next echelon of client, you want to have a higher profile client, doubling your rates could actually generate you more business. In many instances that's why we ask whether or not there's a budget the clients trying to work within. So as silly as and counter-intuitive as it sounds, you might actually consider doubling your rates in order to generate more business. TRANSCRIPT:Here are a few thoughts on long-term care insurance. I'm John Harrington. Long term care insurance is a very valuable resource to have should something happen to you, you be debilitated or otherwise can't work and you need to go into skilled nursing facility or other location where you need to be attended to and there's daily or monthly costs to care for you medically. Long term care insurance should actually be a tax deductible business expense. I'm not an accountant so you might want to check with your accountant on that, but it's something that you should definitely be considering. It does give you peace of mind knowing that you're not going to have to sell off all your familial assets and essentially go into bankruptcy before medicare, medicaid will take care of you. Long term care insurance is kind of a form of life insurance that protects you or rather, your family while you're still alive from having to declare bankruptcy in order for you to be taken care of because of something debilitating that means you can't work anymore. So look into long term care insurance it's not that expensive and it's well worth it. TRANSCRIPT:Here are a few thoughts on switching to an S-Corp from being a Sole Proprietor or starting out. I'm John Harrington. When you're a photographer oftentimes you start out as a Sole Proprietor, you're filing your returns on the Schedule C and someone gave you the idea that you probably should switch to an S-Corp. It's a good idea. Something we talk about in another segment. I'm talking to about that how you actually go about switching to an S-Corp. Switching to an S-Corp is really easy, frankly it's pick up the phone and call a lawyer there are lawyers who for you $500 $1000, my lawyer actually was $750, will charge you to switch to file all the necessary paperwork to file an S-Corp. Filing an S-Corp isn't a big deal. It's very easy, articles of incorporation are simple to write. They are fairly boiler plate for most lawyers who are familiar with doing that and they'll do it for you fairly quickly. So get a lawyer, a competent one who knows how to file S-Corp in your local jurisdiction, and you'll be all set. It's really very simple. TIPS60 - Should You Quit Your "Day Job" To Become a Full-Time Photographer? TRANSCRIPT:Here are a few thoughts on whether you, if you love our hobbyist photography, should become a professional. I'm John Harrington. The short version is, if you love what you're doing as a hobbyist, stick with it as a hobby. It's something that you do to relax, to entertain yourself, to blow off steam, to just kind of get away from the office. If you love what you do as a hobby stick with it as a hobby. If you're going to become a professional you're going to actually have to treat the business of photography like a business. You're going to have to treat it like you do your day job, your nine to five job. I strongly encourage you to consider that, when you switch from being a hobbyist to being a professional, that you really are starting a business from the ground up, from scratch and hopefully you will find that you can focus on staying as a hobbyist and not becoming a professional, unless that's what you want to do seven days a week. So before you consider making a jump from hobbyist to professional, recognize that it is a business and that's something that you need to stay completely professional on and not treat just like your hobby. TRANSCRIPT:Here are a few thoughts about the value of life insurance. I'm John Harrington. The value of life insurance can't be understated you definitely should have life insurance. In most cases it's tax deductible as a part of your business expenses. No, I'm not an accountant or lawyer so this should not be considered tax advice or legal advice, but look into getting life insurance because it will give you peace of mind. As someone who has life insurance I happen to use New York Life and think the world of them, they're a past and present client of mine, but I made my decision about going with them independent of that relationship. Life insurance lets you know that and let's your family know that if something were to happen to you, God forbid, that they would be taken care of in your absence. So strongly encourage you to look into life insurance. It should well be a tax deductible business expense as a part of what you're doing as a freelance photographer, whether an S-Corp or a Sole Proprietor. So look into life insurance, definitely worth having. TRANSCRIPT:Here are a few thoughts on talking about your success or lack thereof. I'm John Harrington. In the field of photography frankly, in any field, you don't ever want to be bragging about how much money you made on any given assignment or any given month or any given job. There's a kenny rogers saying from one of his songs, ""You never count your money when you're sitting at the table, there will be time enough for counting when the deal is done."" I definitely subscribe to that notion whether I had a great month or not so great month or a particular job that I was really excited about. I generally do not discuss the success or lack thereof I've had in any given month. I would encourage you to do so. Talking about your successes, especially talking about how much money you made or didn't make really is not a good idea when it comes to talking to your colleagues, talking to your clients, because if you talk to a client and you tell them, ""Oh, I did this $10,000 job the other day"" and they're only paying you $1,000 that might not go over too well or they might think you don't need them next time and they'll call someone else. So don't talk about money especially with clients and don't brag. TRANSCRIPT:Here are a few thoughts on the value of PLUS. I'm John Harrington. PLUS or the Picture Licensing Universal System is a industry standard that allows you to license your work in a way which everyone knows about and understands what you're saying. So, if you're referring to and ad slick or you're referring to a bus back or bus shelter where your pictures being licensed. Everyone understands that what that means and there's no ambiguity because the Picture Licensing Universal System, PLUS, which is free. Check out the URL below. Really explains it, everyone's gotten together ad agencies, media, art buyers, stock photo agencies, everyone's gotten together and agreed on exactly what the licensing language is so that there's no misunderstandings. In addition PLUS is creating this registry which will help photographers and image buyers connect if someone's got an image, they're trying to find who owns the rights to that photograph, they can reach out to them and find them through the PLUS registry. TRANSCRIPT:One of the things that a lot of cameras have a problem with, no matter what professional grade camera you are working with, is that every lens and every camera combination are not perfectly calibrated, perfectly matched to them, to each other. Now you can take and send your cameras off to Nikon Professional Services, Canon Professional Services what have you and have them do all the calibrations for you. There is a fee and obviously you are without your cameras for a while. There's a really great solution that we encourage, it's actually called the Spyder LensCal tool. What's great about the Spyder LensCal tool is that it lets you focus on an exact known position and have the camera say that it's in focus at that point and then if it's actually not, off by a millimeter, off by a few inches it can actually be adjusted in camera. The camera remembers each of the lens positions for each of the focus points for the lens positions and it's a really great tool to make certain that everything you shoot that's in focus really is in focus. TIPS60 - A good job grows clientele, a bad job costs you clients! TRANSCRIPT:Here are a few thoughts on the value of any given client. I'm John Harrington. When you're talking to a client, they've decided to call you they've made a whole host of decisions about whether or not they want to work with you. The only reason they are calling you is because they're considering working with. So you to want to make sure that all of the things that went up to that phone ringing, don't get lost and all of the sudden the job falls apart and you don't get a chance to do that work. The challenge of course is once you keep that client, and make them happy, recognize that that client, that one job, for conversations sake let's say it's a $500 job, is all of a sudden going to parlay itself over the course of a lifetime relationship with that client into ten plus jobs. Even if you're only getting one job a year, it's going to be a lot. So any given job that is worth $500, if you keep that client, is going to be worth ten times that or $5,000, but if you make a mistake and screw up that $500 job costs you that same $5,000 down the line because they're not gonna call you back.